This is the 29th book by Tim Winton, four-time winner of the Miles Franklin Award, twice shortlisted for the Man Booker Prize, fierce environmentalist and Australian National Living Treasure. He loves his native Western Australia, except, to judge by his next-to-last novel Eyrie, Perth. Indeed, the rawer and more remote the better, as far as Winton is concerned, and it doesn’t get any rawer and more remote than the salt flats of this novel. Jaxie shrewdly sur-mises that he will be held responsible for the accident, given what excellent reason he had to wish his father dead: the Captain used to prop up his masculine ego by beating up his now-dead wife and Jaxie himself. The Captain is, indeed, a prime example of the “toxic masculinity” Winton has made it his business to speak up against; and Jaxie, damaged by his proximity to this toxicity, may well be “maturing” into a like brutality: ready to beat up anybody who offends against his fragile ego, casually racist and sexist, accompanying his father on blood-soaked hunting trips, Jaxie seems set fair to turn into a later model of his bestial father. All that can save him is an inarticulate hankering for a better life, represented for him by his cousin Lee, with whom, to the scandal of her mother, he is in love, and to whom he is making his slow and onerous ways across the salt flats of the outback. Winton has been accused of misogyny, because his novels tend to explore the male experience, with the women a somewhat distant, if often inspiring, presence. Whereas the charge of misogyny is manifestly unfair, it is true that here, too, both the mother and Lee remain offstage. Somewhat unexpectedly, “that wanting feeling” finds its focus, very inarticulately and in the face of Jaxie’s extreme prejudice, in the unlikely, enigmatic Irishman Fintan MacGillis, the inhabitant of the eponymous shepherd’s hut, literally in the middle of nowhere. He, it soon appears, is a disgraced priest, and Jaxie, no more enlightened in this regard than any other, leaps to the erroneous conclusion that he must be one of the “pedo” priests that have been in the news in Australia as elsewhere. “Don’t you understand me, boy, Can’t you see it? Jaxie Clackton, you are an instrument of God. “Oh, I said. You mad fucker. You been out under the moon too long! 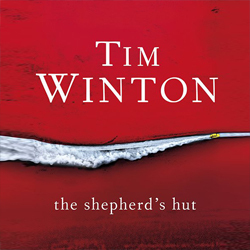 The Shepherd’s Hut is a sparse, haunting, memorable novel, once again proving Winton’s technical brilliance and compassionate quest for the humanity of his wayward characters.